Turns Out There Is Such a Thing as Too Much Dancing! Proof of how flexible I was before surgery! I'm hoping you had a wonderful Thanksgiving, and enjoyed some quality time in whatever manner came your way. Christmas is just around the corner! But let's back up about giving thanks: this year I have much to be thankful for! As I write, I'm sitting with an ice machine circulating cool water around my left knee, to reduce the pain and swelling I have from a TKR (Total Knee Replacement) surgery I had exactly one week ago. Turns out there can be such a thing as too much dancing ‐ my poor left knee was worn to just bone‐on‐bone. So I'm grateful for ice! I am grateful that knees are something that can actually be replaced (like worn‐out car parts?) That's purely amazing! I'm grateful for Kent's attentive ministrations while I recover. I'm glad for the skill of the surgeon who completed the surgery in 1.5 hours (and continually referred to me as his "young, healthy patient"! And honestly, while this is serious and painful surgery, I'm grateful that the need for it comes from the fact of a well‐lived life that has been filled with the pleasure walking and dancing for all of the last 60 years! 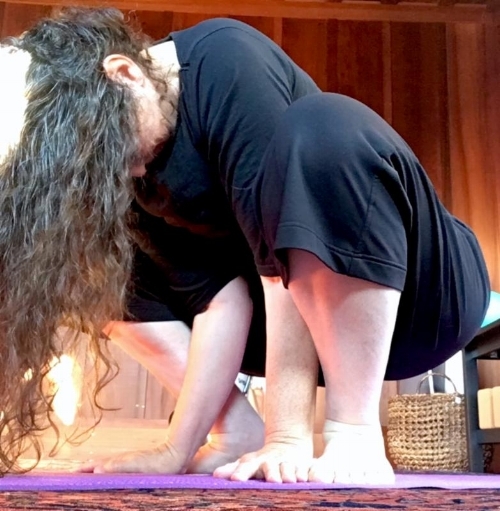 I'm glad I kept up with yoga for the last several years (see day‐before‐surgery pic above) because I'm making good progress‐‐ already walking with a cane. I'll be back up and running in plenty of time for a very full 2018! Oh, yikes‐‐it's almost time for a new year, too! In that case, I need to wish you all the finest of holidays, and may 2018 surpass all expectations! "You guys make a good team with your different styles of conveying information." "The instructors created a safe and encouraging space to learn the material." "I liked being face to face with you two teachers...singing together and switching roles from high to low, melody to harmony; I was not sure I could do that and was pleasantly surprised! THE BEGINNING WORKSHOP is just that­­for folks who haven't any or much experience singing harmony. In two hours, we'll take you through some simple harmony singing, and by the time we're done, you'll have a good grasp of how to sing something besides the melody! THE ADVANCED WORKSHOP will bring you from an intermediate singing experience to understanding how to work on your own harmonies, and this will include some very fundamental aspects of music theory. ON JANUARY 20 from 3:30 onward, Libby and I will be hosted by Lyons Filmer on The Celtic Universe radio program on KWMR in Point Reyes Station. We will talk about singing harmony, our workshops and Carmony, and even demonstrate live what WE do to find harmonies on the fly. It will be a lot of fun for us (Lyons is a great DJ!) and you might enjoy learning more about how the workshops, well . . . work!